Considering purchasing the Cameo WOOKIE 400 RGB Laser - with 2 year Warranty? Have questions? Ask people who've recently bought one. When using in sound mode, when no bass or kick is playing, will the pattern stay the same, and then change when the beat comes back? Depending how you set the sensitivity, yes i should do, the laser reacts best to bass, but will respond to mids and highs is the volume is quite high. The best bet is to experiment with the sensitivity, but well worth it, a very good 'club quality laser' especially when used with haze or fog! 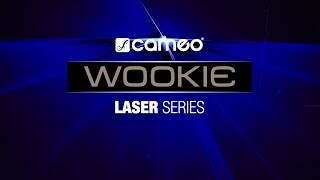 Do you own the Cameo WOOKIE 400 RGB Laser - with 2 year Warranty? Why not write a review based on your experience with it. Love this product! Easy to set up and the effects are mesmerising. Used in a large bar at one of my gigs and it easily filled the room with light. Works well in normal conditions but really comes to life when used with a smoke machine. I would recommend this product to any home DJ or someone wanting to bring a bit of extra wow to their light show. Very good fixture for price , RGB, very good color overlay that created a great electric purple and cyan. At 400mw this fixture is perfect for mobile djâ€™s and small clubs. DMX is good but also the sound to light is amazingly accurate and changes to the beat. Would highly recommend for budget laser if you do not require ILDA control. Does the job, you'll need a fog machine! This device craves DMX to get the best out of it. The Sound activation alone is so so. For a simple plug and play without a controller it's best to just switch to automatic mode. Quite happy with it. Very happy with this laser. Spent a lot of time asking around as everyone was saying the RGB couldn’t do Yellow and the RGY couldn’t do Blue, but there is an image on the product page of a projected shape showing Red, Green, 2 shades of Blue, Purple and Yellow. Nobody could tell me which model this was from as the only negative thing I can say about Cameo is they produced a single video for the whole Wookie range and don’t tell you which one they are showing you. Long story short. I bought the 400 RGB. It CAN do Yellow, it CAN do Purple and it CAN do White within its RGB range. Looks awesome. Super lightweight, Super compact. Highly recommend it. Also recommend that Cameo should put a little more focused model specific information on their product pages and make a video for each model rather than one for them all making you guess which one you're looking at. Arrived quickly, like all produces from Djkit. fab. lighting effect with the added bonus of a white coloured laser used it twice now and have had many wonderful comments on it. Seen a video for Cameo WOOKIE 400 RGB Laser - with 2 year Warranty online or have you own video? 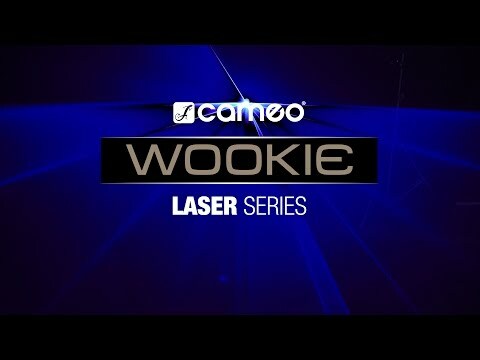 Check out Cameo WOOKIE 400 RGB Laser - with 2 year Warranty on DJkit.com!